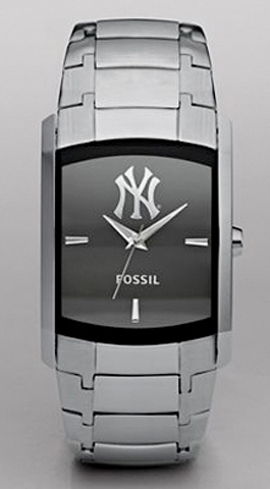 Click the button below to add the New York Yankees Fossil watch Mens Dress Regis Stainless wristwatch to your wish list. 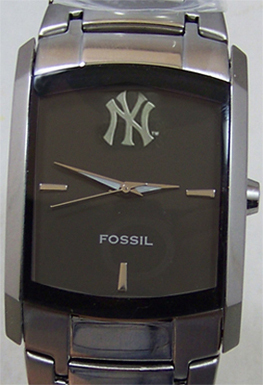 NY New York Yankees Fossil Dress Watch, NEW. Fossil MLB1067 Mens Regis Dress Stainless Steel wristwatch. MLB Baseball sports fans team logo wristwatches. One ONLY: and listed on multiple sites. It will be pulled from all sites once sold! 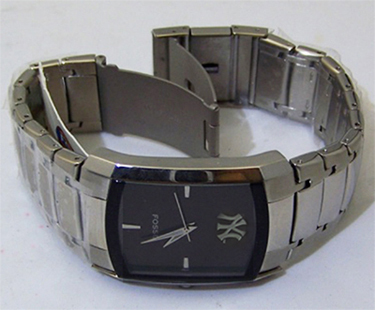 This new mens NY New York Yankees Regis dress watch features a sleek black dial with Silver team logo at 12 O'clock. set in a polished stainless steel case with a comfortable contoured stainless steel bracelet. Ships NOW in a collectible Fossil watch tin. Three hand quartz movement. This watch is in new, unworn condition. Very few were made, they have been sold out for quite awhile. It is very rare to find one in this new unworn condition. In hand, Ships NOW in a Fossil Collectible Tin.